Have LinkedIn Got The Answer To Advertising For B2B Firms On Social Networks? Facebook and Twitter have become revolutionary in terms of advertising for business-to-consumer marketing. However, business-to-business marketers have remained apprehensive and mainly on the side-lines when it comes to advertising and social networking. LinkedIn has changed this phenomena and has become increasing popular for B2B businesses since it reached the 100 million users milestone. After learning about advertising on LinkedIn, I wondered actually how many firms are using this? LinkedIn advertising has become set up so that firms can target their desired needs in depth and the targeting is completed by the means of data that each user enters in their profiles. The advertising can include both display ads and targeted email marketing. The possibilities are endless for both small businesses and large enterprises with the skilled and vast networking, offering an up-to-date take on B2B marketing that is proving beneficial for a number of different companies. It allows you to target a very specific audience, by location worldwide, job title & function, industry & company size, seniority & age and finally by LinkedIn groups. The example below shows how you could target a specific group such as ‘Digital Marketing’ worldwide. It has an interesting tool on the right which shows you what your estimated target audience would be. 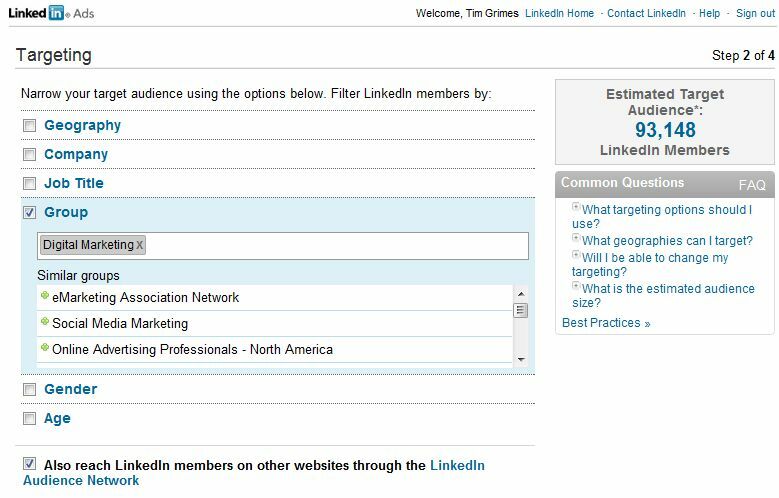 Although the majority of firms advertising are from finance/banking, travel or technologies, there are now a few marketing firms specializing in LinkedIn advertising for organisations. Of the 100 million members that you can target, there are: 7.9m Business Decision Makers/5.5m High Tech Managers/1.3m Small Business Owners and 4.2m Corporate Executives. There are three standard sizes of the adverts that you choose from – 300x250, 728x90 and 160x600. The ads predominately get displayed on the right hand side of any LinkedIn page and stand alone, unlike the self-service ads. The text of the ad has a limit of 75 characters, not including the URL, and you may also include a title of up to 25 characters. The cost according to their website is also relatively competitive although a recently study showed that it isn’t as effective as one would hope. The study compared the advertising alongside Facebook, and found the average cost per click was considerably more on LinkedIn than Facebook, but obviously this would vary for each campaign. When deciding costing, you have two options on how you can pay for your ads, these are: Pay per Click (CPC) and Pay per 1,000 Impressions (CPM). Most people choose this CPC method, which means that you pay when someone clicks on your ad. This method allows you to specify a bid - the maximum amount you're willing to pay for each click, for example $3.00 per click. LinkedIn shows you a 'Suggested Big Range', representing an estimate of the current competiting bides by other advertisers targeting a similar audience. Alternatively you can choose the 'Pay per 1,000 impressions', where you pay for each 1,000 times your ad is shown, no matter how many clicks you receive. Although LinkedIn only recommend this option for people with past experience advertising through this method. LinkedIn advertising is clearly to target business professionals, but can they get away with charging more than the other social networks? I believe this is the best platform for a B2B businesses, however it is still relatively undiscovered and I wonder how many businesses are actually using this to their full advantage. Do you currently use LinkedIn, let us know your thoughts? Alternatively if you need help setting up your social media accounts or advertising, don’t hesitate to contact us here at Return On Digital.